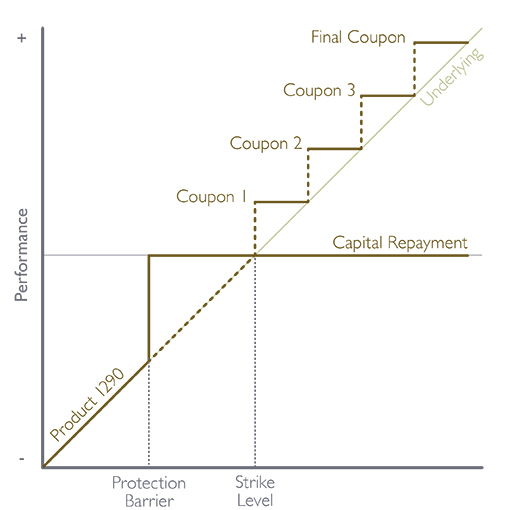 Capital Repayment Full repayment at maturity only if the Underlying meets certain pre-specified condition (for example, closing above a certain level (the 'protection barrier'). This can be measured throughout the term (sometimes referred to as an 'American' barrier) or at maturity only (sometimes referred to as an 'European' barrier), depending on the terms of the product. The repayment of capital will typically depend on how far the Underlying has fallen at maturity. Expects the Underlying to meet the specified condition set out for the income to be paid during the term of the product. Has a moderate to high risk profile (willing to put capital at risk).